Posted by M Bharath Bhushan in Culture, Identity, regionalism, Telangana. Who is afraid of the 29th State? Watching the NDTV programme compeered by Uma Sudhir et al on Telangana, I was amused to listen to some youngsters say “they [Telanganites] make fun of our Telugu, we feel humiliated”. How many of them realize or know about the humiliations suffered by Telangana people? Once a vegetable vendor told me that I speak good Telugu, that is, like they, people from Andhra speak. In schools children were made fun of if they spoke Telangana Telugu. Today practically all, at least most, school going children speak Telugu of Andhra. Language has been just one of the issues in the Telangana movement. After all language spoken by, imitated by most people, is the language promoted by the dominant ruling class. Posted by M Bharath Bhushan in ecology, Economy, Hyderabad, Telangana. Now that the Congress and the United Progressive Alliance (UPA) have announced their backing for Telangana’s Statehood, the economic prospects and growth potential of India’s proposed 29th State have once more come to the fore. 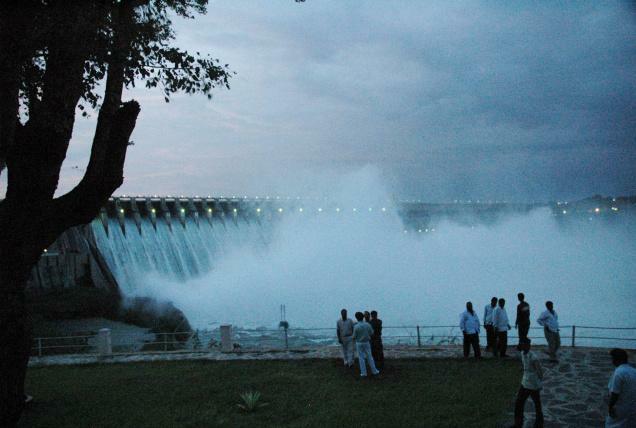 The Telangana region, comprising 10 of the 23 districts in Andhra Pradesh, has a larger area than the other two regions, Rayalaseema and coastal Andhra. 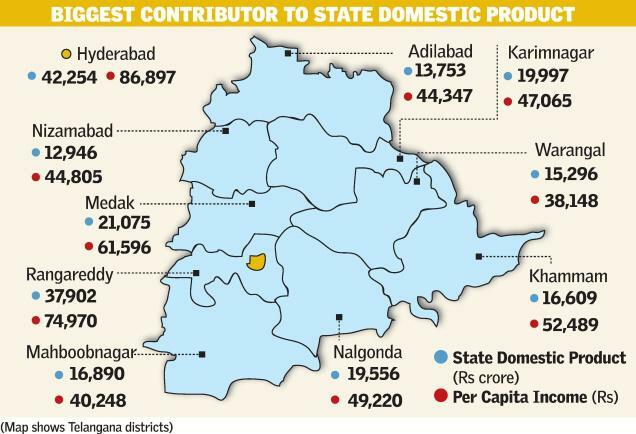 Excluding Hyderabad, Telangana sprawls over 1.14 lakh sq km, while the four districts of Rayalaseema cover 67,000 sq km and the nine coastal districts encompass 92,800 sq km. Fundamentally, the Telangana economy is vibrant, thanks to the contributions from Hyderabad and Rangareddy districts. Telangana’s broad economic parameters, such as the Gross State Domestic Product (GSDP), which is the total value of goods and services produced in a given year, and standard of living as indicated by per capita income, appear to be sound vis-à-vis the Andhra and Rayalaseema regions. The aggregate gross district domestic product of the proposed state’s 10 districts in 2009-10, stood at approximately Rs 2,16,281 crore. Posted by M Bharath Bhushan in Andhra, Culture, heritage, Hyderabad, Identity, regionalism, Telangana, Telugu. With the final phase of demerger of Telangana from Andhra Pradesh imminent, the emotional element must now be replaced by cold and hard thinking of the opportunities that such a reorganization offers to both successor States – Seemandhra and Telangana. Both states have a reasonable fiscal position. The breakup of population and the revenue, expenditure and surplus is given below. As can be seen, the two regions will constitute medium sized states and are not ‘small’ by any criteria. The revenue and expenditure figures are the average for 2003-06 as given by to the Assembly. The figures for “Headquarters” has been reallocated on the basis of population of the two states. It is reported that in 2012-13, the state’s own tax revenues stood at Rs 69,146 crore. Allocating Headquarters tax revenues to the two successor states by their population proportions, Telangana revenues will be Rs 25,767 crores and Seemandhra revenues Rs 43,379 crores. Figures for expenditure are not available but they are likely to have grown faster than revenues since 2006 because the AP government had gone on a spree of free spending and huge borrowing to fund its many populist schemes and defunct new irrigation projects under Jalayagnam. Posted by M Bharath Bhushan in Culture, Economy, heritage, Identity, Nizam, regionalism, Telangana. The long-cherished dream of the people of Telangana is going to be a reality soon. The region will be demerged from the combined State after 56 years of cohabitation inflicting great pain and sentiment of separation. But, this is how States or nations do emerge and develop. This is not the time to reflect on our common culture and heritage as no one is physically isolated or rehabilitated elsewhere, as in partition. We continue to live and sail together enriching our common culture, language and future sharing our experiences and resources. We may briefly reflect here on the economic status of the region. The Economic History of the region narrated by Adapa Satyanarayana, Ramakrishna Reddy, Thirumali, Vasant Bawa and others clearly shows that it had a distinct character different from others. It is really a puzzle how the Nizam accumulated so much of wealth in a land-locked region. It is revealed that the economic activity in the form of industrialisation was initiated by the State which got its resources through primitive accumulation. It was the Nizam who had invited outsiders to cultivate 40 lakh acres of barren land during the 1920s that helped create agricultural surplus for public investment. Posted by M Bharath Bhushan in regionalism, Telangana. Union Agriculture Minister Sharad Pawar said he favoured a united Maharashtra but would not oppose the demand for a separate Vidarbha state. “I am for the state, for the unity of the state. But I am also of the firm view that if a sizeable section of the society, particularly from the (Vidarbha) region want a separate state and that separate state will be a viable state, then I will not come in their way,” he told a news channel in an interview. Pawar, also the Nationalist Congress Party chief, was responding to a query on his stand on the renewed demand for Vidarbha state after the Congress approved creation of Telangana out of Andhra Pradesh. Posted by M Bharath Bhushan in Andhra, politics, Rayalaseema, regionalism, Telangana. Hyderabad: Defiant Congress leaders from Andhra and Rayalaseema regions ignored the party high command’s directive to withdraw their resignations and upped their ante on Saturday night by adopting three resolutions, one of which demanded reconsideration of Telangana decision and asking Chief Minister N Kiran Kumar Reddy to quit. About 90 Congress ministers, MLCs and MLAs had an over five-and-a-half hour meeting with the Chief Minister and PCC chief Botsa Satyanarayana this evening. Among other two resolutions adopted is putting on hold the bifurcation process until a high-level committee headed by Union Minister AK Antony submitted its report on the modalities related to the division. In the third resolution, the Congress leaders took strong objection to the manner in which the party’s Central Working Committee took the decision to divide the state without any road map. “All legislators, including the Chief Minister and the PCC president, were signatories to the resolutions,” senior MLA Anam Vivekananda Reddy told reporters at the end of the meeting.